–The Mount Vernon Trail: This paved bike path rambles 18 scenic miles from Roosevelt Island up to George Washington’s historic estate at Mount Vernon. Cyclists will ride past Ronald Reagan International Airport and through Fort Hunt Park on their way to the top. –The Capital Crescent Trail: A 13-mile ride on a mixture of pavement and gravel, this route follows an abandoned rail line from Georgetown to Rosemary Hills. It is a shady, tree-lined ride that passes through affluent local neighborhoods and offers views of the historic Chesapeake and Ohio Canal. –The Rock Creek Hiker/Biker Trail: This paved route was formed by the linkage of various different paths over the years, eventually creating a 20-mile ride that brings cyclists past the National Zoo, an equestrian center, and some nice picnic sites on the north side. The last part of the trail goes to Beach Drive, which is closed to auto traffic on weekends. 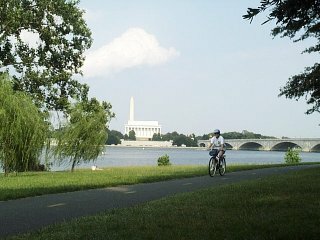 There are hundreds of miles of scenic bike paths in the Washington, D.C. area. The above are only a handful of the many options available, ranging from easy day rides through town to grueling mountain climbs and paths over 150 miles long.